"These Are My Credentials!" 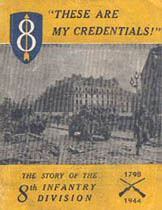 is a small booklet covering the history of the 8th Infantry Division. This booklet is one of the series of G.I. Stories published by the Stars & Stripes in Paris in 1944-1945. This is the first of a series of G. I. Stories of the Ground, Air and Service Forces in the European Theater of Operations, to be issued by the Stars and Stripes, a pulbication of the Information and Education Division, Special and Information Services, ETOUSA... Maj. Gen. D. A. Stroh, commanding the 8th Infantry Division, lent his cooperation to the preparation of the pamphlet, and basic material was supplied to the editors by his personnel. HE Story of the 8th Infantry Division as told here is not complete, for it only highlights the events leading up to and including our first campaigns of World War II. The overall picture of our progress can only imply the individual acts of heroism and sacrifice leading to combat success. It is not possible to record in these few pages the names and achievements 0f the comrades who have left us. Their sacrifice will be engraved forever on our memories. Always a part of our team in spirit, they will carry on with the 8th to final Victory. EPTEMBER 19, 1944: The capture of Nazi General Herman Bernard Ramcke was pure and unexpected velvet, but the right climax to the finish of the Crozon Peninsula campaign. Ruthless, hard-bitten, he had already turned down two chances to quit, and had just ducked out of Brest. He was the extra dividend on the training in the Deep South, the Arizona desert, Northern Ireland, and then the hard hacking down from the Ay River into the knowledge of what it is to play for keeps. Smashing ahead on the heels of its own artillery barrage, one hour before the attack of September 19, the 3rd Battalion, 13th Infantry, caught the Germans piling out of their shelters, before they reached their positions. As the assault companies drove north, the reserve company, Company I, was left to clear a strip of west beach, heavily salted with pillboxes and coastal guns. Platoon Commander 1st Lt. James M. Dunham, leading his men through the emplacements, spotted the white flags first. And so Lt. Gen. Ramcke might have been his baby. But a German medic insisted in precise English that the general was waiting below in a dugout for the American commanding officers. He wanted a first class surrender. In a few minutes Brig. Gen. Charles D. W. Canham, assistant division commander; Col. R. A. Griffin, 13th Infantry commander; and Lt. Col. Earl L. Lerette, 3rd Battalion commander, had gone to inspect their catch, 75 feet underground. "I am to surrender to you," Ramcke told Gen. Canham through his own interpreter. "I want to see your credentials." Gen. Canham pointed to the eager dogfaces crowding the entrance with their M-1s. "These are my credentials." This blunt phrase put the Nazi in his place, and paid dramatic tribute to the real power behind America's armies — the G.I. The peninsula campaign folded when a truce was signed that evening. In two months the 8th had accounted for nearly 15,000 prisoners, vast quantities of supplies, and a lasting crimp in the enemy's morale. It was a combat achievement that put the division into the big time play for Berlin. N 1918 the 8th had landed in France too late to quarrel with the Hun, but this time the division got in virtually on the ground floor — on D-plus-28, at a beach on the Cherbourg Peninsula. The 121st infantry had dived hopefully into a realistic "embarkation" several weeks before the 8th finally pulled out of Belfast Harbor, but that was a dry run, and the division didn't hit the Continent until July 4. Preparations for battle were completed in the vicinity of Montebourg by July 6. Cherbourg had been taken, and the Krauts had been chopped out of the northern tip of the peninsula to the vicinity of La Haye du Puits. Yet even with the aid of allied air superiority, Nazi resistance was dogged on the line through Carentan and St. Lo, eastward to Caen on the Orne Estuary. HE plan called for the VIII Corps, to which the 8th had been assigned, to punch with three divisions south of La Haye du Puits. The 8th was scheduled to pass through the 82nd Airborne Division, taking the center of the corps front to hammer home the main drive. On the second day of the action at La Haye du Puits, Brig. Gen. Nelson M. Walker, assistant division commander, had been seriously wounded while in the front lines. He died next day. The first objective, the Ay river, was strongly defended. With the 28th and 121st Regiments on line and the 13th in reserve, the division jumped off on its first attack early on July 8. Participating in the division's initial crack against the enemy was fair game for the 28th, for in World War I that regiment was the first American combat outfit to set foot on European soil. That was on June 28, 1917, under the command of Col. Hanson Ely. A part of the 1st Division, it trained under the famed French "Blue Devils," and subsequently helped to quash the German threat against the Channel ports. This regiment likewise stored a notable combat record in the Battle of Soissons, on July 18, 1918. and later in the destruction of the St. Mihiel salient, the slugging in the Argonne, and at Sedan. The grateful French decorated the members of the Regiment with the Fourragerre. Until the "Peace" was signed the 28th kept a "Watch on the Rhine," returning to the U.S. shortly thereafter, and remaining a part of the 1st Division until 1939. In the summer of 1940 the regiment joined the 8th Division at Fort Jackson, South Carolina. The 28th was organized in 1901 at Vancouver Barracks, Washington, and soon thereafter was sent to Mindanao, P.I., to cut military roads through the jungles and suppress the Moro headhunters. The mission accomplished, it returned to serve ten years of garrison duty in the states. In 1913 the regiment patrolled the Rio Grande, and the next year became part of the expedition which occupied Vera Cruz. ALVERN HILL, Sharpsburg, Chancellorsville, Spottsylvania, Tanner's Creek, Seven Pines, Mechanicsville, Cold Harbor, Gettysburg — such scenes of Confederate valor founded the tradition of the 121st Infantry, which originally stemmed from the colorful Georgia Militia — the Baldwin Blues, the Floyd Rifles and the Barnesville Blues. They were at Appomatox. In 1891 they became the 2nd Infantry of the Georgia National Guard. At Camp Harris, Ga., in August 1917, the unit was redesignated the 121st infantry — "The Old Gray Bonnet Regiment" — and assigned to the newly formed 30th Division. Reorganized in 1919 as a part of the Georgia National Guard; the regiment broke into active service for a short period in 1934. On September 16, 1940 it was inducted into federal service at Fort Jackson. There on November 22, 1941, it replaced the 34th Infantry Regiment as part of the 8th Division. OW in 1944 the regiment was heading toward Brest, where it had landed almost 26 years before — on October 18, 1918. Which brings us back to the 8th Division's trouble on its first day against the enemy defenses of the Ay, the day on which the division reclaimed 1000 yards of France. At night a counter attack hit the 121st Infantry, which repulsed it by a night attack of the regimental reserve battalion. In the morning the division slugged again, to be met by another counter attack. But on the third day local Nazi withdrawals were indicated and the 8th picked up speed. Infantry elements isolated small pockets of the enemy, bypassed them and forged ahead, leaving the corps cavalry to clean up. German machine gun fire was heavy and the enemy mortars were accurate. Tougher still, a communications break sent the 3rd Battalion, 28th Infantry, 1000 yards beyond adjacent units, thereby exposing its flanks. Before contact could be restored, the Nazis had badly mauled Company L in a counter-attack. The 13th Infantry attacked for the first time on the morning of July 13, when the 28th dropped into division reserve. If the Nazis had bothered to consult their version of American history, they might have been confused by what was coming at them that morning. It was historical haywire by their standards, for less than one hundred years before, the forbears of the 13th and 121st Regiments had fought on opposite teams in the Civil War. HE 13th Regiment was formed on July 16, 1798, shortly after President George Washington retired. First action came at Lewiston, N.Y., in the War of 1812 when Queenstown Heights was taken. The City of Buffalo raised a monument to the 13th at Fort Porter, hailing the exploits of the regiment on the Niagara frontier. Until the final battle of Plattsburg, the 13th (which had become known as "The Jolly Snorters") was continuously engaged. Active service in the Mexican War was followed by the reconstituting of the regiment on May 3, 1861, with General W. T. Sherman commanding and Philip Sheridan as one of its captains. Service for the regiment has been continuous since then. In the Civil War, the 13th took and held Vicksburg for a short while on May 19, 1863. Seven men carried the colors that day, and all seven died. Of the entire attacking force only the 13th reached the Confederate position, but even their attack was repulsed. Here the regiment paid a high price for its motto. "First At Vicksburg." In Cuba, in 1898, the 13th took its cut of San Juan Hill, and Private Agnew of Company H captured the flag of Spain. The regiment returned to San Francisco in 1900, following a year in the Philippines, and in 1903 Company I served at Fort Liscum, Alaska. Two more Philippine tours came in 1905-07, and 1911-17. The 13th tied in with the 8th Division in January of 1918. At the end of World War I units of the regiment were stationed in New England until October 1939, when the 13th was ordered to the Canal Zone. Its personnel was transferred to other organizations in June 1940; but in July 1940, the regiment was reconstituted at Fort Jackson. LL of this is a far cry from the front before the Ay on the 'morning of July 13, 1944, but tradition has much to do with what followed in the campaign which eventually took the 8th Division to Crozon. Progress that day was slow, but on the next day both assault elements reached the north bank of the Ay. When the VIII Corps directed that the positions be held, it was time to figure the profit and loss. The division had achieved its first objectives, suffered its first casualties. Hedgerows had become as familiar as the training terrain of Tennessee, Georgia and Northern Ireland. But this time the umpires wore Red Cross brassards, and the Joe on the other side was no Joe at all, but a killer. There had been brodies, and smart plays. Contact between adjacent units had been lost, flanks exposed, and enemy counter attacks were hard going. All this paid off with heavy casualties. On the credit side the artillery had learned that a morning barrage prior to the day's attack only alerted the enemy. Instead, heavier harassing fires were laid down, and the artillery concentrated on neutralizing and knocking out strong points uncovered by attacking infantry elements. This typifies the process of building up a foolproof combat technic, which went on in every unit of the division during those first few days of the real McCoy. On July 12 Brig. Gen. Donald A. Stroh assumed command of the 8th Infantry Division. For eleven days the 8th sat tight, waiting for a new VIII Corps offensive. At last the attack was definitely scheduled to begin at 0530 July 26. The line of the Ay from the river's mouth to the bridge at Lessay was swampy and so strongly held that an advance southward by the 79th Division was out. The Lessay bridge was gone and the only ford in the river was impassable because of mines and crossfire. The 90th Division was in a similar fix. And only the 8th's front, two kilometers wide, was suitable for an attack. To the 8th went the task of overcoming the enemy defenses to the south, and establishing a bridgehead between the south bank of the Ay and the Lessay-Perrier railway. Through the gap the 79th Division was to fan out to the southwest, and then rip out the German defenses along the western sector of the river line from the flank. Spearheaded by the 8th, the 90th Division and the 6th Armored Division were to bypass the German strongpoint to the east, continuing the attack on the southeast. T was up to the 8th. Both assaulting regiments — the 28th and 121st — jumped off on schedule. The entire division sector of advance was under observation from a church steeple. Corps and division artillery chewed away at it for two days before the enemy resigned his ringside seat. Resistance was met by the 28th, attacking with the 1st and 2nd Battalions forward. Following a reorganization halt, a second attack was launched at 1500, penetrating the enemy's main defensive position. The 28th Infantry reached the Lessay-Perrier road, rendering untenable the entire enemy position along the corps front. The 121st Infantry reported no resistance initially, but in the afternoon it was evident that the report was optimistic. Some elements had been pushed back across the Ay. The next day's plan called for the 28th Infantry to hold until the 121st came abreast, at which time both regiments would attack in conjunction. Meeting little resistance, the 121st caught up with the 28th at 1400 that afternoon, and at 1500 the coordinated attack began against light artillery and mortar fire, and numerous mines. This day marked the beginning of the mass retreat of the German Seventh Army. The 79th, 90th and the 6th Armored Divisions poured through the gap, lashing west and east to pursue the fleeing enemy. American armored forces raced, forward to begin the lightning thrusts through Brittany and Eastern France, which were to sweep beyond Paris to Holland and Belgium. DVANCING against light resistance on the morning of July 28, the division won all its objectives, and in the following days the pursuit of the enemy continued. The 4th and 6th Armored Divisions had passed through the VIII Corps sector. The 8th (minus Combat Team 13) followed in route column, pounding south through Coutances, Granville and Beauchamp, to an assembly area southwest of Avranches. Combat Team 13, motorized and attached to the 4th Armored Division, had been having a show of its own, securing La Jourdanniere and later La Meurdraquiere. By August 1, it was back again with the 8th. The division worked southward during the next two days, clearing out small pockets of resistance and securing road nets and vital installations along the line of march. On August 2, Combat Team 13 again was attached to the 4th Armored, swinging south to St. Aubin d'Aubigné, 11 miles north of Rennes. The remainder of the division reached the vicinity of St. James by nightfall of August 3. The division movement continued by truck on the morning of August 4. Meanwhile, Combat Team 13, having reached St. Aubin d'Aubigné, discovered that the enemy had withdrawn from Rennes, and it then passed through the city to occupy the heights to the south. By 1100 the situation was so favorable that the division commander ordered the remaining elements to move to an assembly area at Betton, slightly northwest of Rennes. The 8th (less the 121st Infantry, which remained near St. James in corps reserve) continued to hold and defend Rennes. Some prisoners were taken but no contact was made with organized forces. On August 8 the 1st Battalion of the 28th Infantry was attached to the 6th Armored Division, operating toward Brest. The 121st Infantry, under VIII Corps control, was attached on August 6 to the 83rd Infantry Division, and headed toward Dinard. It encountered determined enemy resistance in the vicinity of Tremereuc on August 7. During the ensuing six days it found the territory around Pleslin and south of Plertuit hotly defended by pillboxes, heavy machine gun and mortar fire, minefields and obstacles. On August 9 the Nazis cut off the 3rd Battalion until the late afternoon of August 12. Two artillery planes successfully dropped blood plasma for the battalion. After the occupation of Dinard on August 14 and 15, the 121st Infantry reverted to the 8th, which was then in an assembly area in the neighborhood of Dinan. Preceded by its task force, the 8th then headed for a concentration area near Brest, having remained near Dinan from August 13 through August 17. On August 14 a task force mainly composed of the 3rd Battalion of the 28th Infantry, and platoons of cannon, antitank guns, tank-destroyers, tanks, combat engineers, and field artillery, moved enroute to Cap Frehel Peninsula to take over positions formerly held by the French, and reduce the enemy. The balance of Combat Team 28 rejoined the 8th on August 15, forcing the enemy to capitulate before noon. The score was 390 Kraut P. W.'s. On August. 21, the 8th, which for three days had confined itself to patrolling, closed in its sector and prepared to attack southward toward Brest. That same day the Assistant Division Commander, Col. Canham, became a Brigadier General. Once again the 8th was to carry the ball, when orders were issued for the division to make the main effort of the corps in the center, immediately north of the city. At nearly midnight on August 24, the 13th Infantry and the 28th, plus certain attached units, infiltrated toward objectives. The attack was launched the next day shortly after noon, for an average advance of 1200 yards against determined resistance. The attack continued through August 26 against a deeply intrenched enemy employing intense fire. The gain was 300 yards more. Enemy resistance mounted from August 27 to August 29. After slight advances, the 13th and 28th Infantry Regiments consolidated their positions and held firmly. The enemy called a medical truce on the morning of August 29, in order to evacuate dead and wounded. N August 30, Brig. Gen. D. A. Stroh, division commander, was promoted to Major General. On that day and the next the 8th consolidated further small gains and regrouped. Simultaneously, the 121st Infantry, which had been held in division reserve, relieved the 28th Infantry which, in turn, went into division reserve. On August 31 the division prepared for a coordinated corps attack, to include the 9th Infantry Regiment of the 2nd Infantry Division. A road in the vicinity of Kergroas was its objective. On September 1, the 121st Infantry, in conjunction with the 9th Regiment on its left flank, opened the attack which, beside cleaning out strong enemy pockets of resistance in the villages of Kergaclet and Kergroas, materially assisted the 2nd Division in the capture of Fourneuf. The next day, attacks by both the 13th Infantry and 121st Infantry forced the enemy to withdraw, but a shortage of artillery ammunition prevented the formulation of detailed plans for a resumption of the attack in the division zone. Activities from September 5 to September 7 were confined to patrolling and to the holding of occupied positions. Improvement in the artillery ammunition supply on September 8 made it possible for the 121st Infantry, in the face of severe enemy resistance, to attack and seize the eastern end of the heavily organized and strongly defended Lambezellec ridge. The 121st Infantry advanced westward toward Lambezellec, and by noon the 2nd Battalion was fighting there. The 13th Infantry advanced abreast to positions from which it could support the attack of the 121st Infantry against Lambezellec. N September 10, having passed through Lambezellec, the 121st Infantry was confronted by Fort Bouguen. This was a formidable work consisting of thick walls between twenty-five and thirty-five feet in height, surrounded by a deep, dry moat. Within the division zone the western extremity of these walls rested on the Penfeld River, pierced only by one narrow entrance, not wide enough for vehicles. This entrance passed through two tunnels and across two narrow bridges. That was only half the problem. Between the river and the inside of the wall was a steep cliff, which could not be assaulted by infantry without extensive engineer demolitions or by breaching the wall with heavy artillery fire. Examination of the plans of the fort, as well as diagrams and photographs of the ground, indicated that demolitions were impracticable. On September 11, heavy artillery fire was directed on the wall of Fort Bouguen, but this failed to make an appreciable dent. The Commanding General, VIII Corps, decided to suspend further operations against that portion of the inner defenses of Brest and to contain them in the vicinity of Fort Bouguen, while efforts were renewed further east. He therefore directed that elements of the 2nd Infantry Division relieve elements of the 8th in front of the fort. Accordingly, on September 12, the 13th and 121st Infantry Regiments with attached units withdrew to a temporary assembly area in the vicinity of Plouvien, to be ready for operations on the Crozon Peninsula. Two days earlier, the 28th Infantry (less the 2nd Battalion which remained in division reserve) had been moved towards Guilers to relieve three battalions of the 29th Infantry Division which had been making only limited gains during the preceding forty-eight hours. When the 13th and 121st Infantry Regiments moved to Plouvien, the 28th Infantry Regiment remained on its mission, preparatory to being withdrawn, as the 29th Infantry Division progressed to the east across its front. At this time the 8th was withdrawn from the action at Brest and sent to the Crozon Peninsula, which reportedly was a strongly-held threat to the Port of Brest that would prevent its use by Allied Forces, even after Brest had been taken. N the Crozon Peninsula, Task Force A, commanded by Brig. Gen. Herbert L. Earnest, had been holding the German forces west of a line about fifteen miles from the four finger-like tips of the peninsula. The enemy had prepared strong defensive positions. Crozon was expected to be a hard nut to crack, and when the 8th Division moved into its attack position on September 14, it had, in addition to the tanks, tank destroyers, and engineers already attached to it, Task Force A, composed of the 1st Tank Destroyer Group, the 35th Field Artillery Group, 83rd Armored Field Artillery and the 15th and 17th Cavalry. West of the line of departure, two main ridges ran parallel to the end of the peninsula, where it branched into four fingers, two on the north, one west, and one south. A stream split these ridges. The 28th Infantry Regiment was to advance along the north ridge, where an airfield in the vicinity of Lanveoc was expected to be stubbornly defended. The 121st Infantry Regiment was to take the south ridge, passing through the town of Crozon. The 13th Infantry Regiment was in division reserve. Task Force A, with a zone down the center valley, was to advance as the infantry cleared the dominating ridges, and mop up remaining pockets of resistance. N the morning of September 15, after a terrific barrage by our heavy and light artillery, and chemical mortars, the attack was launched in a drizzle of rain that later cleared. In the zone of the 28th Infantry, the 3rd Battalion, under command of Major Donald R. Ward, led the attack. By 0930 it had advanced 500 yards and was approaching the hamlet of St. Eflez. The 3rd Battalion, and the 1st following it, were under heavy flanking artillery and mortar fire from the south ridge. All the officers of Company L became casualties, and Tech. Sgt. Charles H. Ballance reorganized the company and took command. He was killed by a sniper the next day. In the vicinity of St. Eflez the resistance grew so fierce that it was apparent the main line of the enemy defenses had been reached. On the south ridge, Company G, 121st Infantry led the column of companies in which the 2nd Battalion attacked. After an advance of 200 yards, small arms and automatic fire met them with an intensity which indicated that in this sector, too, the enemy intended to hold to the limit. Flat and open ground gave him such good observation that every attempt of Company G to move forward drew an inferno of fire. The night of the September 15 was enlivened by German counter-attacks which promptly were repulsed on both ridges. At 0700 the next morning our forces renewed the attack under cover of a dense fog, an effective mask for each morning of the Crozon action. In the 28th Infantry, the 1st Battalion shoved up on the right of the 3rd Battalion. Although the advance for the day was slight, it penetrated the enemy's line. Numerous strong points were reduced, and 150 prisoners were bagged. The 121st continued the attack with its 1st and 2nd Battalions. Stiff resistance persisted, but the regiment penetrated the enemy main line. On the third day of the attack, September 17, that line was broken on both ridges. With it the enemy's confidence in his plan of defense collapsed. Strong points remained to be broken, but through by-passing and reducing them the division advanced at such speed that the Germans never succeeded in regrouping and reforming a line of resistance. A fort which had been considered formidable fell to the fire of one machine-gun of the 2nd Battalion, 28th Infantry. Once having broken the main line, the 121st took objectives with a speed that baffled the harried Krauts. Before the town of Crozon was reached effective enemy resistance had ceased. Y the afternoon of September 17, the shaft of the peninsula belonged to the 8th. It was time to clean out the branching fingers at the western extremity. This ground was dominated by Hill 70, in the zone of advance of Task Force A. In following up the advance of the infantry, the task force had been hampered by the nature of the ground and lack of a road net in its zone. And since it had not reached Hill 70, the 3rd Battalion of the 13th Infantry was committed to secure this key to the last phase of the Crozon story. On the night of September 17-18, a reinforced platoon of Company L, 13th Infantry Regiment, under command of 1st Lt. George R. McLendon, outposted Hill 70 without finding evidence of German occupation. Dawn revealed the outposts of the enemy. Bewildered at being infiltrated, the Krauts became panicky. Sgt. Will R. Wheeler, in charge of a combat patrol of little more than a squad of men of Company L, took over a hundred prisoners, and marched them down the hill to where the main body of Company L was advancing to attack. Before 0900 on the morning of September 18, the 3rd Battalion had occupied the essential hill, and the mop-up of the fingers of the entire peninsula proceeded on schedule. Four forces accomplished this, acting under the division plan almost as independent combat commands. Task Force A reduced the Cap du Chevre sub-peninsula to the south; the 28th Infantry, driving due west, cleared out Camaret Point; on the north, the 2nd Ranger Battalion (which had been attached to the division on September 17) mopped up the Le Fret area; and to the 13th Infantry fell the role of smashing through a massive wall and the old fort guarding the large northern finger, the Pointe des Espagnoles. All of which leads up to the afternoon of September 18 and the capture of Lt. Gen. Erwin Rauch, commanding general of the Crozon Peninsula forces of the enemy. He was the first half of the two-for-one dividend the 8th earned in the way of Nazi generals. The second and larger part of this payoff was Gen. Ramcke, who entered this story at the beginning. They're both out of circulation now, and that's what counts. The campaign for the Crozon completed the 8th's first chapter in the Allies' Victory Book of World War II. This is written in October of 1944 and the 8th is still doing business in a powerful way, and so the complete accounting of the division's exploits must await the end of the war. But what the division already has achieved in combat is a token of that future, as well as of the 8th's training and glorious tradition in the pact. HE present 8th Infantry Division was activated at Camp Fremont, Palo Alto, California, in January 1918, composed of the 8th, 12th. 13th and 62nd infantry Regiments, the 2nd, 18th and 83rd Field Artillery Regiments, the 319th Engineer Battalion. 320th Field Signal Battalion, and 8th Supply Train. Only one of these units, the 13th infantry Regiment, is now in this division. The 8th left Camp Fremont in September 1918, en route to France, but before it had arrived the Armistice of November 11 ended the fighting of World War I. The outfit had to wait a long time. A part of the division was attached to the Army of Occupation and served in Germany until August, 1919. The other elements had returned to the United States in January of that year, where in the following month the division was disbanded. In March 1923, it was reconstituted as an inactive unit, and on July 1, 1940, at Fort Jackson, it was re-activated — the beginning of the 8th Infantry. Division of World War II. Under the command of Maj. Gen. Philip B. Peyton, and with the nucleus of division headquarters furnished by the 8th infantry Brigade of Fort McPherson, Georgia, the revived 8th Infantry Division initially was composed of the 13th, 28th and 34th Infantry Regiments. In November 1941, the 34th infantry was reassigned to another division and was replaced by the 121st Infantry. Of the original artillery elements the 28th Field Artillery Regiment was reconstituted into the 28th, 43rd, 45th, and 56th Field Artillery Battalions. These, with the 12th Engineer Battalion, 8th Medical Battalion, 8th Reconnaissance Troop, 8th Signal Company, 8th Quartermaster Company. Headquarters Company and the 8th Military Police Platoon, complete the 8th Infantry Division as it landed on D-Plus-28. HE origins of the 28th, 121st and 13th Regiments already have been told, but the remaining units of the 8th, with the exception of the 708th Ordnance Company, were activated at Fort Jackson on July 1, 1940. The 708th Ordnance (originally organized as the 208th) was activated in June 1942, during a brief period when the 8th Division was motorized. In September 1941, the 8th (then under the command of Maj. Gen. James P. Marley) took part in the Carolina Maneuvers. After Pearl Harbor it patrolled the Atlantic Coast from North Carolina to the Florida Keys for six weeks. Returning to Fort Jackson late in March 1942, the division resumed its training. The following month, it became the 8th Motorized Division. On July 1, 1942 Brig. Gen. Paul E. Peabody succeeded Maj. Gen. Marley as division commander. In September there was a motor march to Tennessee where the division engaged in two more months of maneuvers. Then, after a brief stay at Camp Forrest, Tennessee, the division set out for its new station, Fort Leonard Wood, Missouri, where it remained until March 1943. On January 24, 1943, Maj. Gen. William C. McMahon became commander of the division. In March 1943, the division moved to Camp Laguna, Arizona, for six strenuous months of desert training. During the latter part of this period, it was demotorized, reverting once more to its original status as a standard infantry division. During this period the 8th Division Band was organized from the 13th and 121st Bands in the division, the 28th Infantry Band having been ordered by the War Department to the 65th Infantry Division, stationed at Camp Shelby, Miss., as their band. Upon completion of desert training, the division returned to Camp Forrest. Late in November, it arrived in the staging area at Camp Kilmer, New Jersey, and on December 5, 1943, it sailed from New York Harbor for Belfast, Northern Ireland, arriving ten days later, Headquarters were established at Omagh, Tyrone County. The 13th and 28th Regiments were billeted at the Ely Lodge and Drumcose estates in Enniskillen, County Fermanagh. The 1st Battalion, 121st infantry, was stationed at Shadow Camp in Fintona and later at Bally-Northland in Dungannon, while the remainder of the regiment was sent to Ashbrooke-Colebrooke, the property of Sir Basil Brooks. Other elements occupied surrounding territory, spreading out over an area approximately thirty miles square. This presented a difficult problem for training, supply, and administrative supervision, which was solved by close and frequent observations and visits by the staff. Training in Northern Ireland was as varied as the limited terrain permitted. Greatest emphasis was placed on small unit tactics, which later paid big dividends in combat. There was much scouting and patrolling, particularly at night, and a vigorous physical conditioning program. Stress was laid on all types of firing. ENERAL Dwight D. Eisenhower visited Enniskillen in April and witnessed a number of small unit problems by members of the 13th Infantry, firing by the division artillery, and a regimental review by the 28th Infantry. Lt. Gen. George S. Patton, Jr., Third Army coanmander, also inspected the troops, commenting favorably on a demonstration of an attack on a fortified position by the 1st Battalion, 121st Infantry. Every two weeks each regiment sent three officers and fifteen enlisted men to a British training camp and received the same number of United Kingdom troops. This exchange helped to promote better understanding among Allied soldiers. As the time for the invasion of France drew near, the training program was expanded to include battalion and regimental combat exercises, command post exercises, and the study of German tactics. Elementary amphibious training was given to all troops, and some units began language classes in French and German. The preparation was complete. "First at Vicksburg" is the motto of the 13th, but "These Are My Credentials" might well become the motto of the entire division — the credentials of tradition, training, and battle experience backed up by fire-superiority, skill, and the will to win. With such credentials the 8th will go anywhere ... anytime. Questions and comments welcome: info@lonesentry.com. Copyright 2003-2004, LoneSentry.com. All Rights Reserved.